CES 2017 is in full swing, with laptops, cars, drones, fridges, connected toothbrushes, and other items being exhibited and announced. In lieu of this, Samsung's joining the party, having just announced its new Chromebook lineup via a press release, with the Plus and Pro looking hugely impressive. We got wind of the Chromebook Pro a few months ago, but we've now got official information on the new laptops. The Pro will be powered by an Intel Core m3 processor, while the Plus packs an unspecified six-core ARM processor. 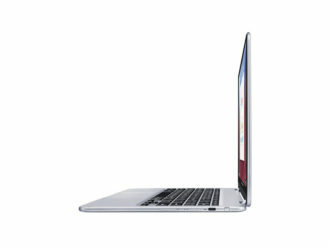 Both come with 4GB RAM, 32GB storage, 12.3-inch and 2400x1600, 3:2 touch screens. Significantly, these displays are 360° hinges, with pens built-in to both laptops, docking to the side when not in use. This pen comes pre-installed with Google Keep and Samsung ArtCanvas functionality, which means note taking is easier than on most Chromebooks, and even some tablets. The Play Store is also preinstalled, so millions of apps are available at the touch of a button. USB-C charging is present, with two ports, although there are no traditional USB-A ports on either laptop. There's also a MicroSD card reader, which may make it useful for transferring files across to a phone. The Chromebook Plus will be available for $449 later this February. The Pro, meanwhile, will go on sale in the spring for an unspecified price. As a bonus, both will ship with AirDroid Premium for one year. 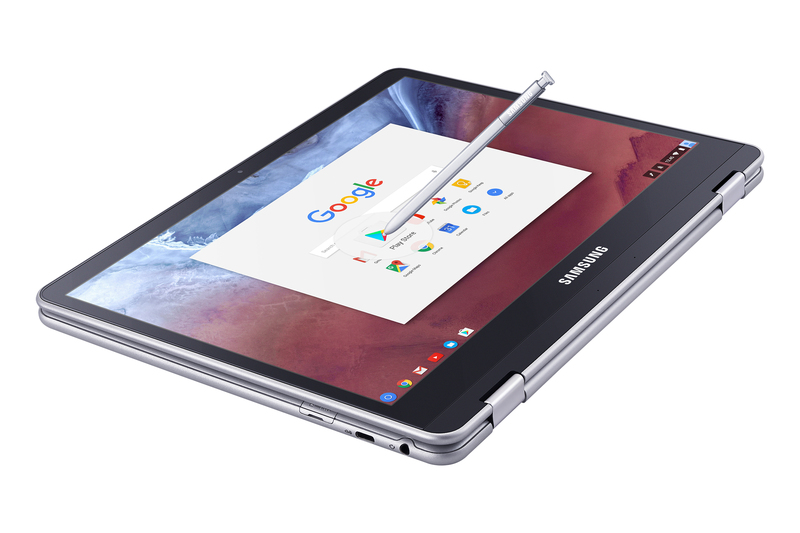 The Chromebook Plus and Pro are designed to be flexible – allowing the user to transform the Chromebook on demand. It is built with a 360-degree rotating touchscreen performing both as a notebook, and an ultra-mobile premium tablet. 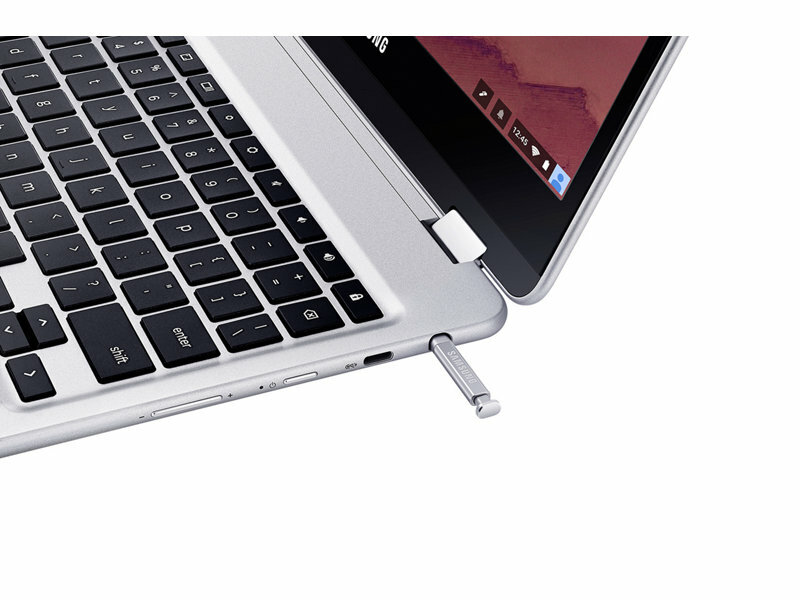 For the first time in the Chromebook lineup the Chromebook Plus and Pro come with a built-in pen, which is embedded on the side of the device for secure storage and easy access. The pen takes convenience to another level with tablet-like benefits, such as the ability to effortlessly take notes and capture on-screen content. The pen is ready to use out of the box with pre-installed Google Keep for notetaking and Samsung ArtCanvas for drawing. The newly developed pen has a 0.7mm pen tip and pressure sensitivity for precise screen capturing. With a sleek, lightweight design, the Chromebook Plus and Pro is a computer people will be proud to own. The high-quality hardware is slim, designed to fit right into consumers’ bags, so it’s easy to carry wherever the day takes them. Additionally, an integrated full-size keyboard and trackpad allows users to write and play from anywhere. The new Chromebook isn’t just a laptop, or tablet – it’s a connection to a world of experience including apps, games and media, all through the Google Play Store. Delivering a stunning, immersive Quad HD 2400×1600 resolution display made of durable Gorilla Glass 3, with a 3:2 aspect ratio– users can game, work or binge-watch on Samsung’s best Chromebook screen. The Chromebook Plus and Pro have upgraded its ports, and now includes two USB-C ports for enhanced connectivity and 4k video streaming, producing high quality video and gaming from the Chromebook on connected 4k displays. The Chromebook Plus and Pro are for the user that wants to do more, create more and get more done all while staying connected. The new Chromebooks deliver a powerful multitasking multi-window experience allowing users to browse on Chrome, work in Google Drive and chat easily with friends on Google Hangouts. The Chromebook Plus and Chromebook Pro also allows users the ability to access apps, work on documents or listen to a playlist while offline. Additionally, traditional Chromebook features like built-in anti-virus and automatic updates remain. 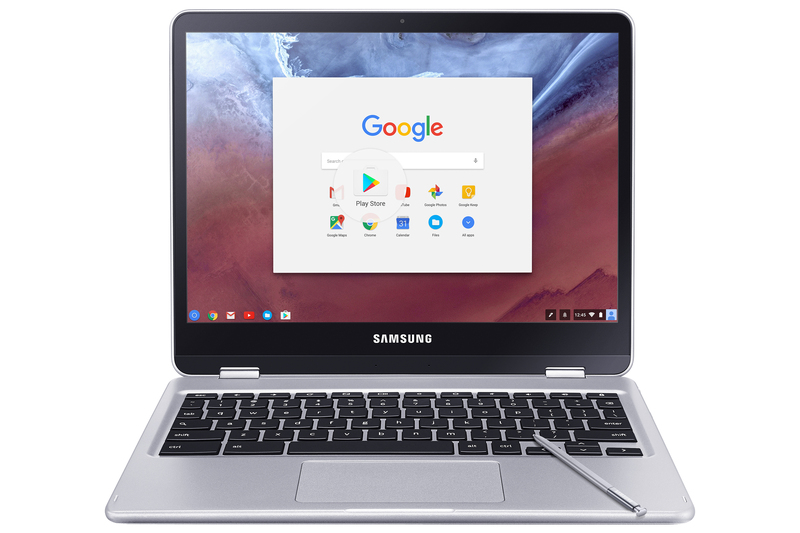 The new Chromebooks have 4GB of RAM and 32GB of storage* and feature batteries that last up to 8 hours**, as well as an enhanced battery life extender to lengthen productivity time. 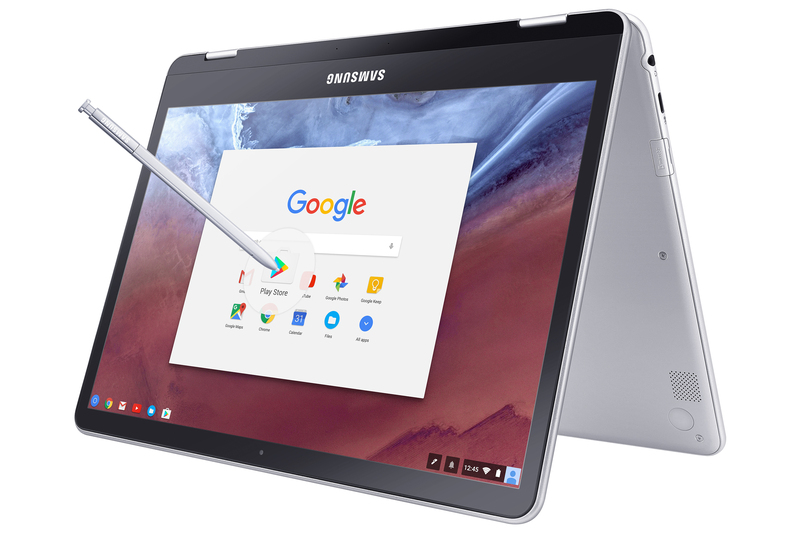 Samsung Chromebook Plus will feature an ARM processor starting at $449 and will be available at major retailers, including Best Buy, in February. The Chromebook Pro will be powered by an Intel® Core™ m3 processor, designed for fast, responsive performance and will be available later this Spring. Both devices will come with the Google Play Store (Beta) pre-installed. 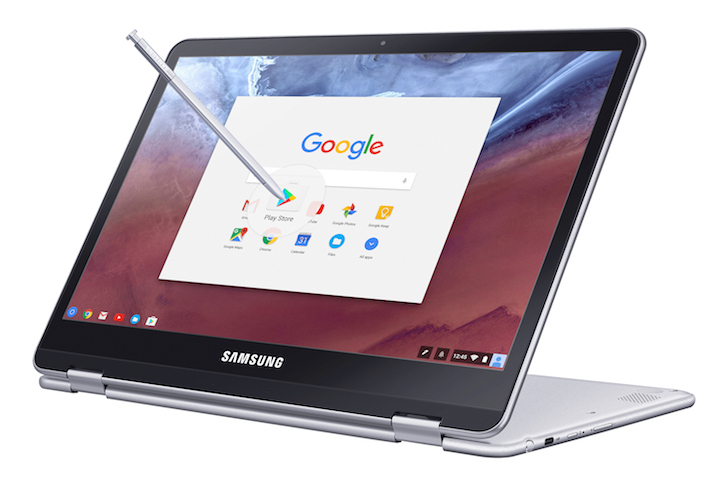 Samsung will debut Chromebook Plus and Chromebook Pro at CES 2017’s regular exhibition hours, from January 5-8 at the Booth #15006, in LVCC, Level 1, Central Hall.